A very-deserving winner, and a good bloke too. I guess they are still there, and Jacobsen wasn't far off. 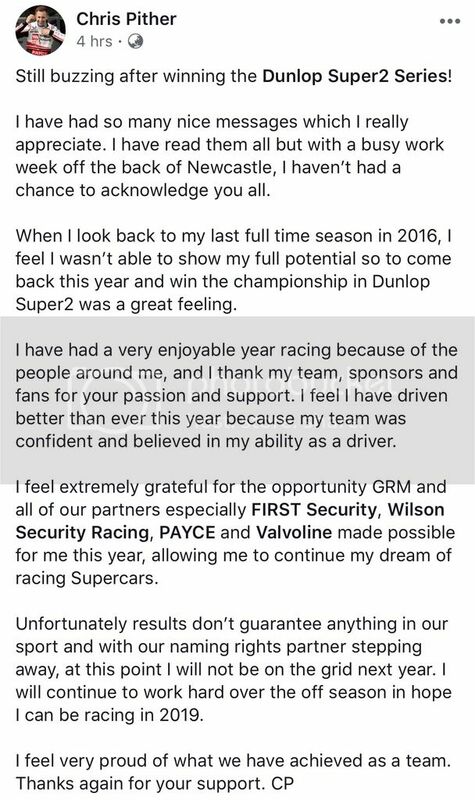 Moffat must be due for a full time drive again....he did a good job at Bathurst. Whisper from the mean streets of Newcastle suggest an altercation last night between two Super 2 rivals. Matt Chahda will be blamed, I'm sure. I saw him run in and just take everybody out. Rullo and Jacobson were at a watering hole earlier in the night, one of the Kostecki's turning up as they were leaving. It seemed to be amicable then.